Introduced at the 1954 New York Auto Show, the 190 SL quickly attracted the U.S. buying public as a less expensive alternative to the 300 SL while having a lot of the same eye ball appeal and styling cues. A 190 SL cost less than half what a new 300 SL did when new in the late 50s. 190 SLs were first available for the road as 1955 models. The 190 SL roadster came with a folding soft top, while a detachable hard top was optional equipment. 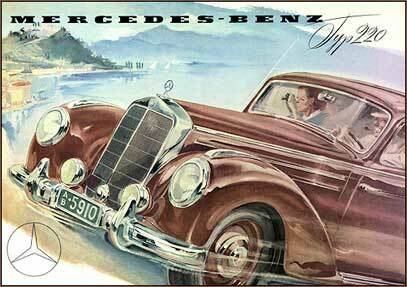 The Coupe version of the 190 SL was essentially a roadster without a folding convertible top, it was equipped with a detachable hard top only. You may have noticed that there are two different types of detachable hard tops for the 190 SL, a ‘small window’ and ‘big window’ version. Hard tops for cars from the beginning of production into October of 1959 were of the ‘small window’ variety. 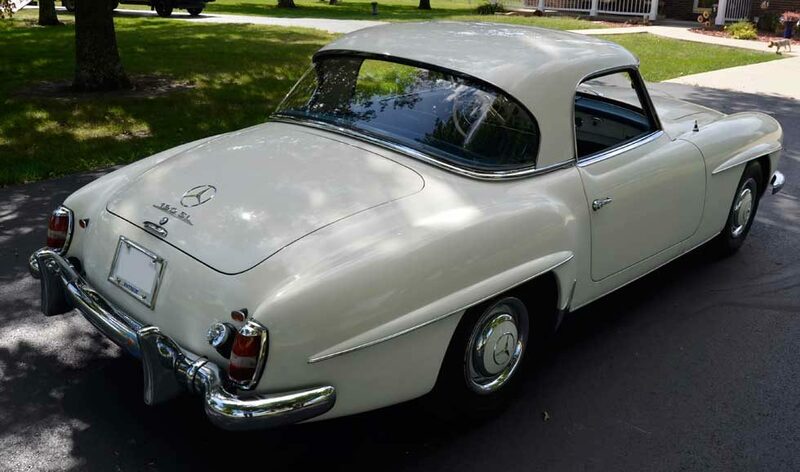 Starting in October 1959 cars came equipped with a revised hard top with a larger back window, very similar to the hard tops fitted to the 300 SLs roadsters at the time. Many photos below illustrating the differences and how they compare to the 300 SL Roadster hard top. 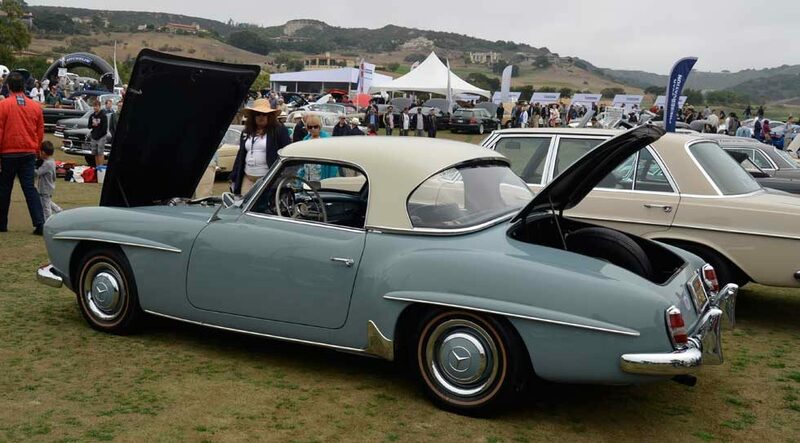 Unless you own a 190 SL roadster equipped with a hard top you may not know that in order to attach the hard top to the car the entire convertible top mechanism must be removed. It’s not like a Pagoda SL where you simply fold the soft top into a well and put the hard top on. Attaching a 190 SL top requires that you remove the entire soft top and the frame it’s attached to. You have to removed several bolts and some trim screws in order to lift out the soft top mechanism, not a fun process and not one that many people go through often. As good as these cars look with their hard tops fixed, I think most 190 SL hard tops end up on storage racks next to the car or hanging from the garage rafters while people enjoy their cars with the top down. This 1956 190 SL Roadster equipped with its correct ‘small window’ hard top was sold at Barrett-Jackson’s Scottsdale sale in 2016 for $93,500. There should be chrome trim around the back window of this car, this rubber seal is incorrect. 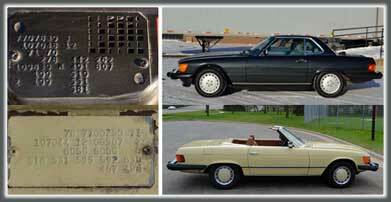 Here are a number of photos illustrating the early ‘small window’ hard top available for the 190 SL. The three quarter view shows the large blind spot created by the large ‘c pillar’ on the small window hard top. 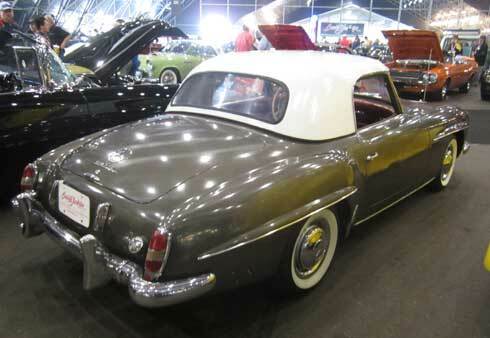 Like all Mercedes hard tops, before or since, the 190 SL hard tops were hefty pieces, complete with headliner. The top was trimmed with chrome around the edges with chrome trim surrounding the back window as well. 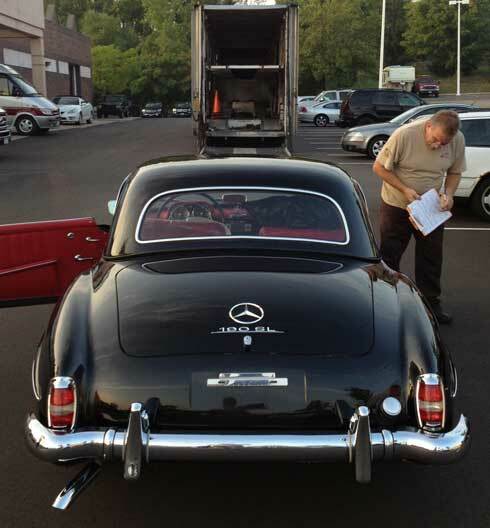 This is 1958 190SL Roadster with its hard top fixed for shipping. The convertible top was carefully packed inside the car for shipping. This back window seal with chrome is correct, unlike the Barrett Jackson car above. This 1958 190 SL in Strawberry Red metallic has a correct for the year ‘small window’ hard top in contrasting Ivory paint. Photo taken at RM Auctions’ 2013 Scottsdale sale. 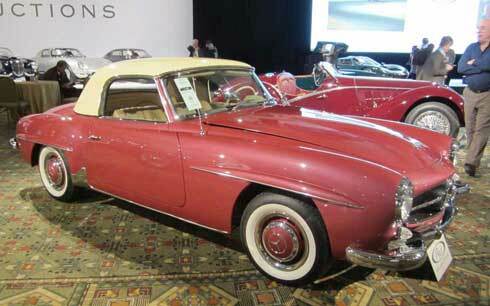 This 1958 190 SL in Strawberry Red metallic (DB 543) sold at RM Sotheby’s 2013 Scottsdale sale for $129,250. It was sold again at RM Sotheby’s 2018 Scottsdale sale for a surprising $196,000 with just a few thousand more miles on its odometer. 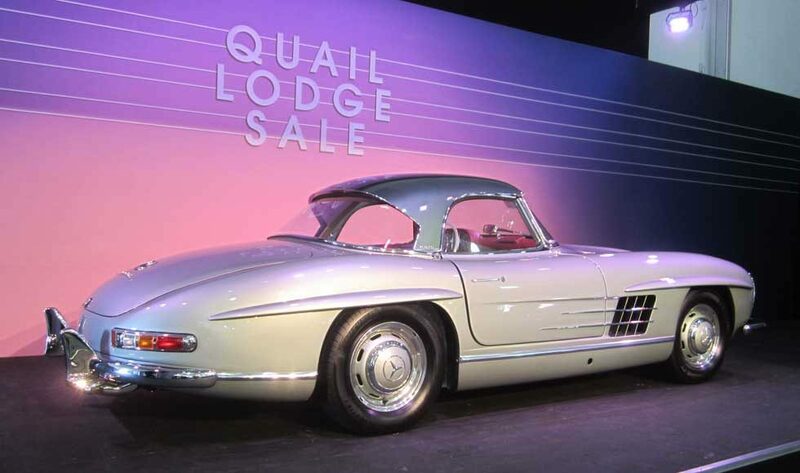 This 1959 190SL was lot 148 at Gooding and Co.’s 2018 Scottsdale sale where it sold for $93,500. The white 190SL at Gooding and Co. (above) was described as having its ‘correct’ small window hard top, so it must have been manufactured before October of 1959. You can just barely see the back window from the side. It’s small and just on the rear plane of the hard top. Later ‘big window’ hard top windows wrapped around to the side, see below. 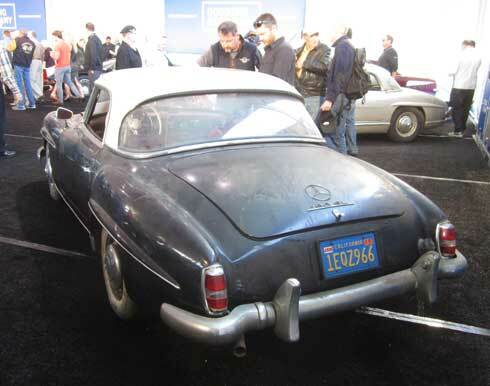 This ‘barn find’ 1960 190SL with its correct ‘big window’ hard top sold at Gooding and Co.’s 2016 Scottsdale sale for $74,250. The ‘big window’ hard top for the 190 SL has very similar lines to the hard top available for 300 SL roadsters. 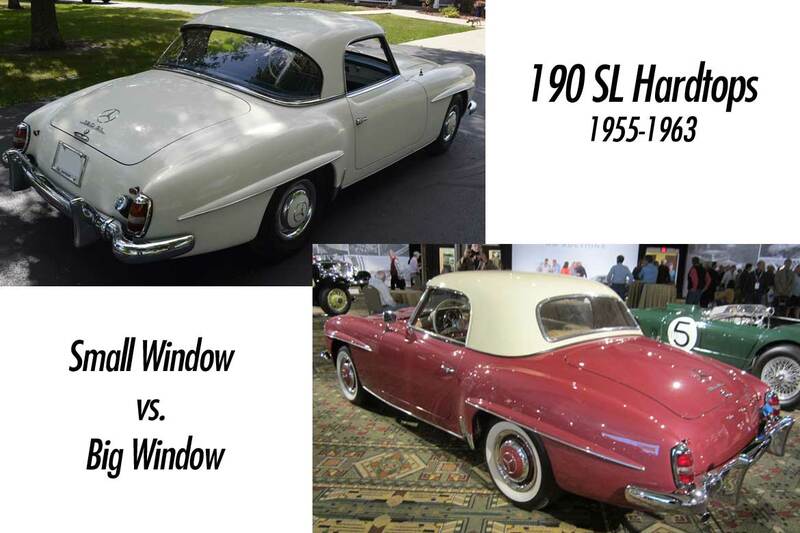 Several photos are provided here, showing the 190 SL ‘big window’ hard top and the 300 SL Roadster equipped with a hard top for comparison. Visibility is better due to the larger window size and smaller ‘C pillar’. Restoration of 190SL hard tops is an involved process. Today, hard top restoration costs, for small or big window versions, easily costs $4,000+ when taking into account the headliner, chrome, paint and seals. This is a 1962 190 SL Roadster with its factory correct ‘big window’ hard top fitted. Note increased visibility with the wrap around ‘big’ back window. This 1963 190 SL in Blue Grey with contrasting Ivory ‘big window’ hard top was displayed at Legends of the Autobahn in Monterey in August 2016. This 1959 300SL Roadster, fitted with hard top, was lot #131 at Gooding and Co.’s 2016 Scottsdale sale, it sold for $1,155,000. Note similarities to 190 SL hard top above. 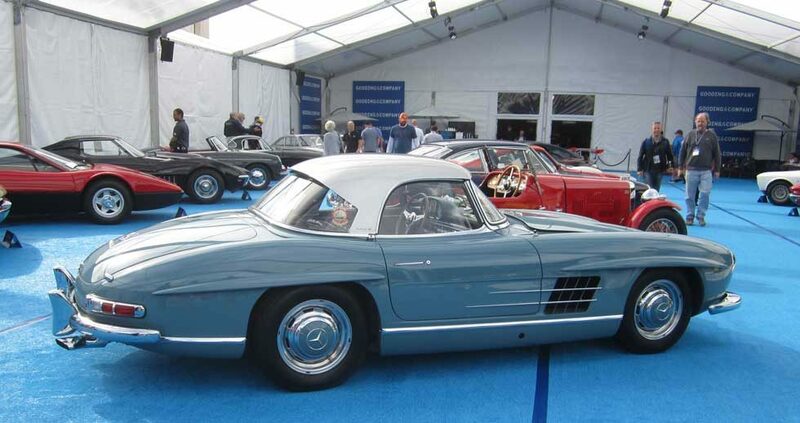 This stunning 300SL roadster with its hard top fixed was sold at Bonham’s 2013 Quail Lodge sale in Monterey. The exact breakdown of 190 SLs that left the factory as Coupes (hard top only cars) and how many roadsters were equipped with optional hard top isn’t known, but it is generally accepted that a roadster equipped with an optional hard top is the most desirable combination of 190 SL for collectors.